So much to navigate—for both students and their families. As leaders we often meet this emotional overload in compassionate and pastoral ways, but sometimes we also do weird things. Like Senior Sunday. Few moments are as awkward as a parade of soon-to-be graduates passing a mic to one another in front of the congregation to share their (often quite effervescent) future plans. Few gifts go as unused as well-meaning graduation books or engraved pens. It doesn’t have to be that way. What if we could redefine this milestone and give it even more meaning in the church? Aside from baptism, the Sunday we set aside to celebrate high school seniors may be the one moment the entire church community comes together to affirm a young person by name. It creates time and space to note that real life transition is taking place, and to communally bless and send these young adults into the world—even if they are physically staying close to home. How can we reimagine not only this service, but also the grad season more broadly? Here are three strategies to consider this year in your ministry. Tweet this: The Sunday we celebrate high school seniors may be the one moment the entire church community comes together to affirm a young person by name. What if we could redefine this milestone and give it even more meaning in the church? Senior Sunday, when done thoughtfully, can help young people and their families transition into what's next without feeling abandoned. Rather than parading students across the platform, rethink how you will create a memorable, meaning-making Senior Sunday this year in your youth ministry and with the entire congregation. Gather a team and develop something authentic to your context. Resources for youth ministry events honoring seniors, including components involving families and options for a seniors-only gathering. Small group leader conversation guides—including touchpoints through the first year beyond high school. Parent discussion guides to make sure in the midst of a hectic season they don’t miss the critical conversations that help their kids make meaning. Creative assets to save you time and help with everything from promotion to message slides to social media. What we say and do in these moments matters, so let’s make it memorable. Parents are often at a loss for how to navigate their own emotions as they fly through the logistics of grad month. They still might be catching their breath from the college decision sprint, or holding their breath about their student’s ability to graduate on time. Now the stream of events and celebrations turns into a flood, and parents might be caught off guard by which “lasts” unleash unexpected floods of their own feelings (and tears). They’re suddenly afraid that as their kids grow up, they’ll grow apart. They wonder what they’ll miss out on as their young adult takes flight while they’re left tending the nest. Parents need steady voices accompanying them through this season and into the next. One way you can help is by connecting them to other parents whose kids are graduating or who are a few years ahead. A natural jumpstart to a parent community might be through a Growing With book club. Consider using those dollars you would traditionally spend on grad books for students and investing them in parents (who actually read books!) instead. 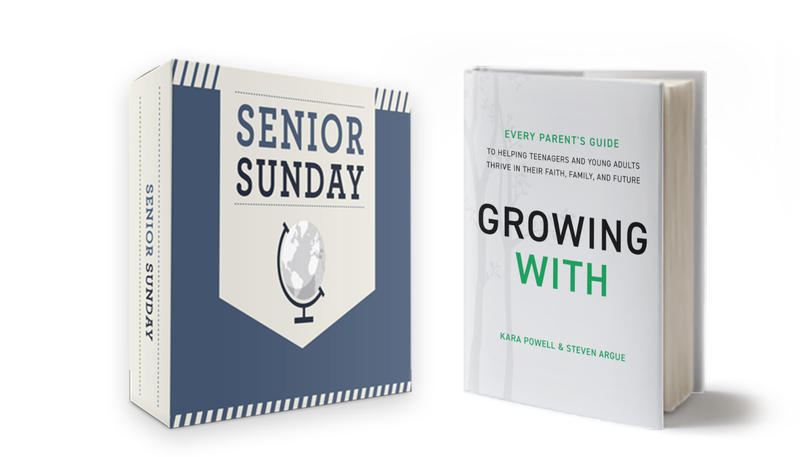 What if this year you gave every parent of a graduating student a copy of Growing With and an invitation to a discussion series with other parents who are also relearning how to parent emerging adults? Written by FYI’s Kara Powell and Steve Argue, this new resource combines research with lived experience into essential wisdom that helps parents grow alongside their growing young adult kids through their late teens and twenties. Exclusively through the FYI store, you can buy copies of Growing With at bulk-price discounts to share. In our Sticky Faith research, we found that six out of seven youth group graduates felt unprepared for life after high school. Rather than walk with them through that uncertainty, we typically program for relational cutoff. You are not going alone into this next season. We aren’t saying goodbye. We are welcoming you into the community as an adult. You always belong here. No matter how long you’re away. Then think through who can provide a web of support surrounding young people entering college, the military, and the workforce, as well as any who will need help completing their high school diploma or walking into adulthood with disabilities or chronic illnesses that shape their paths differently from their peers. Adult friends and mentors are more critical than ever, both for young people who move away and those who remain close. Senior Sunday can provide a meaningful moment to speak these words and reinforce them with communal rituals through which your entire worshiping community can lift up young people and pledge to accompany them faithfully into adulthood. Don’t miss the opportunity to reimagine grad season this year. We’d also love to hear your best ideas and practices in the comments below! Prepare seniors AND their parents for what’s coming next. Shop our online store and equip families to take their next step.